As much as I resisted using a walking aid, it was love at first try for my aluminum walking sticks, which are the perfect complement to my bionic knees. I challenged them right away with back-to-back days traversing a very large, crowded, art fair, and a sizable outdoor mall. Each day, I walked two hours before my get up and go got up and went, far exceeding the 20 minutes I had been averaging without a walking aid. At the end of the first week, I had increased my walking speed from 95 to 105 steps per minute, covered twice the ground with my longer strides, was much more stable and not nearly as winded, and felt taller as the walking sticks demand good posture. The only negative is that they make it difficult to carry packages — shopping's reward. 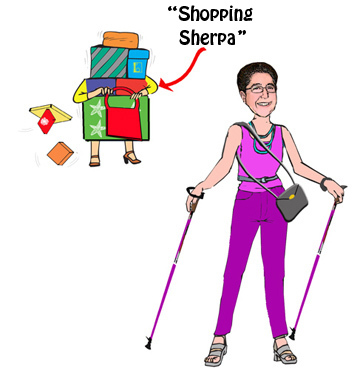 Not to worry, though, I have a solution: "Shopping Sherpas" who, for an hourly fee, would carry our packages as we shop, and then take them to our cars. 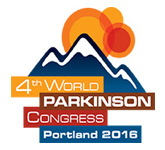 Difficulty walking is one of the most disabling features of Parkinson's. It increases our risk of falling, decreases our mobility, robs us of our independence, and chips away at our quality of life. Walking issues become more common as Parkinson's progresses and disrupts our normal brain rhythms. The good news is that gait training, combined with "rhythmical auditory cueing," can help us move better and faster again. I suspect that my brain's normal rhythm is like the cheerful melody that announces the ice cream truck's arrival in my neighborhood. Hearing the first few notes sends visions of chocolate éclair bars dancing in my head. I "run" out to the curb to greet my favorite vendor. This is in keeping with research findings that we regain more normal movement when we respond to external rhythms of music and dance. Count the steps you take in a minute while walking at a comfortable speed. This should be the number of beats per minute your walking music. Download a free app that analyzes the cadence of your smart phone music library and creates a playlist of songs at your target number of beats per minute. In the interest of full disclosure, I do not walk anywhere near two hours a day, especially all at once, unless it is tied into an activity. Also, I still have good and bad days like everyone else, including the "temporarily healthy." The good days make the bad days more bearable, and the future more hopeful, further proof that the most effective medicine is that which we make in our own heads.